Whoot Whoot!!! You haven't seen the last of me yet! That's right, I'm back :) for a few more days this month at least. Today's project is for a wedding my husband and I are going to next month for some very dear friends of ours. With everyone posting ideas through pintrest on what they want certain parts of their lives to be like, it was easy to get an idea that this wedding is going to be nothing but Pure Country. We just received our invitation a few days ago, and boy was I right on my guessing, the bride chose creams and tans for her base colors, she added burlap and a bright green for accents. Her invitations were so cute, I can only imagine what the event will be like. After I got married, I realized I had all these little trinkets I wanted to keep but had no one place to store them all safe and sound. 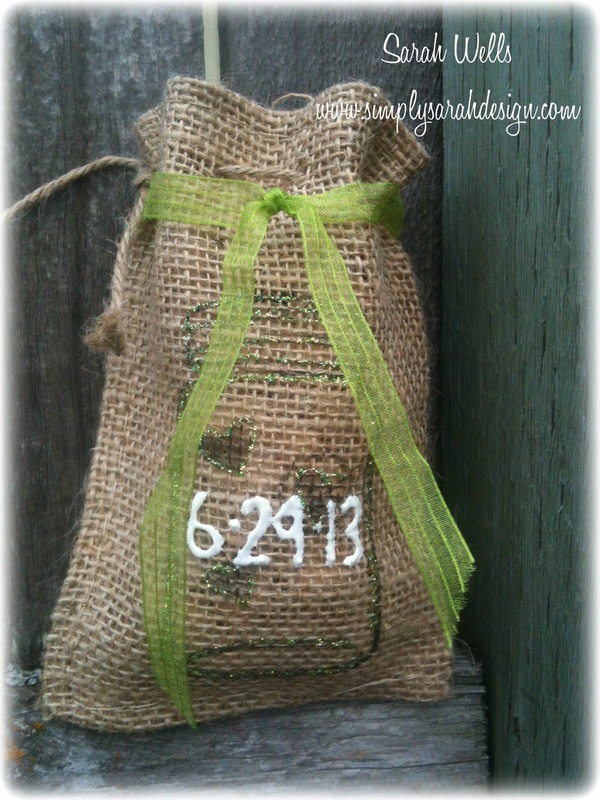 I bought these adorable burlap goodie bags and went to work. Many of her posts on pintrest included mason jars for different parts of the event. Good thing Jaded Blossom has a great one!!! 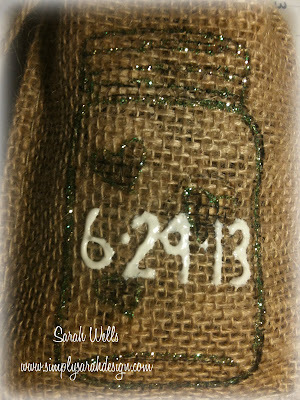 I inked heavy on the stamp since the burlap is course and I wanted the image to be clear. I used the Jar stamp from the Spread the Love set. Then I used hearts from the Wedding Candies stamp set and just put a few in the jar. They kind of look like fireflies too. 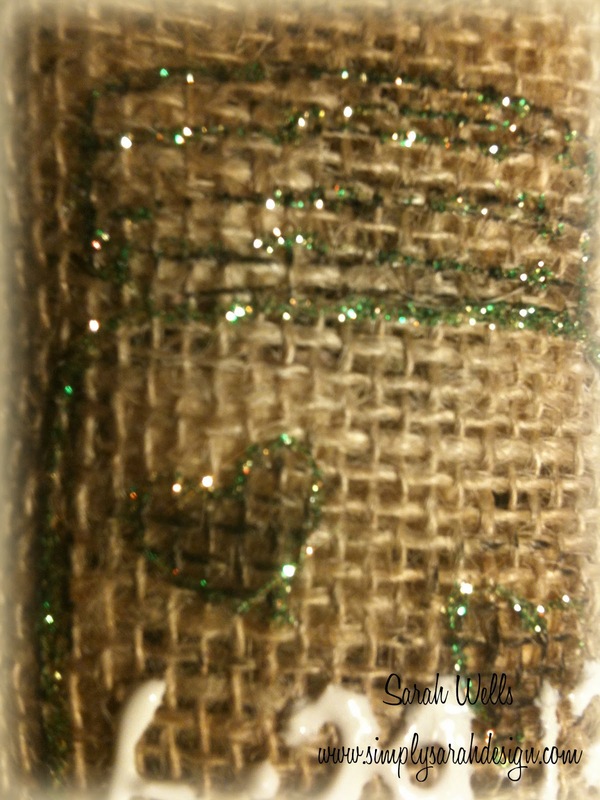 I went over the outside and some accents of the jar and around the hearts with lime green stickles. and over the top of it all, I put their wedding date. I used the ribbon from her invitation to tie around the top of the bag. I plan on using this as the gift bag for part of their wedding present. I hope you like it, I sure enjoyed making it. and you can bet I'll be updating you on how amazing the wedding was when we get home. cute idea ! 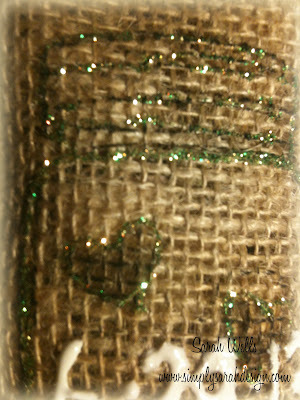 love the glitter and of course the burlap !! !